Wisconsin has historically been a rush-heavy team with talented running backs. But that does not happen without the massive linemen for which the program has become known. Former Badger running back Montee Ball ran behind three-time Pro Bowl center Travis Frederick. Future Hall of Fame offensive tackle Joe Thomas helped plow the way for Brian Calhoun, and first-team All-American tackle Chris McIntosh blocked for Heisman Trophy-winning running back Ron Dayne. No. 4 Wisconsin is more of the same this season: a running back — freshman Jonathan Taylor — leads the Big Ten with 1,806 rushing yards, while running behind big-bodied offensive line. In a battle of highly regarded lines, No. 8 Ohio State’s defensive line will look to combat an offensive line similar to what it is used to in the Big Ten championship game Saturday night. The Badgers average 243.3 rushing yards per game, substantially more than their 182.8 passing yards per game. Taylor runs behind a monstrous line featuring five underclassmen. Though each of the linemen still has at least one more year to grow, four of them at least 6-foot-6 and each are listed at between 315 and 336 pounds. For reference, only one Buckeye starting lineman — 6-foot-7 redshirt junior right tackle Isaiah Prince — stands taller than 6-foot-5. Redshirt senior linebacker Chris Worley said the line’s relative size does not concern him or the team. “The size, that’s not something that we consider,” he said. “The thing that we do have to prepare, though, is that they have a great offensive line and the thing that they do well is they finish their blocks. 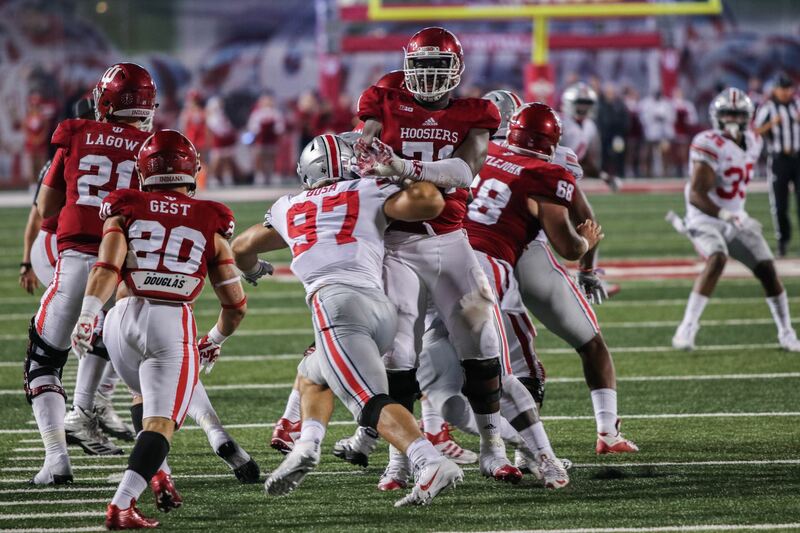 Ohio State has dominated less-talented teams’ rushing attacks, especially teams that do not have big, physical offensive lines, even if they have good running backs. Michigan State averaged 1.9 yards per carry against the Buckeyes, Nebraska ran for 2.8 yards per attempt and Maryland averaged 1.2 yards per rush. Even Penn State Heisman Trophy candidate running back Saquon Barkley picked up just 44 yards on 21 carries against the Buckeyes. But Penn State’s offensive line did not pose much of a challenge for Ohio State, which had 12 tackles for loss in the game. Against Oklahoma, which has a line similar in size to Wisconsin, the Buckeyes defensive line seemed less dominant than usual. The Sooners only averaged 2.8 yards per carry, but the pass-focused offense protected quarterback Baker Mayfield well and opened just enough holes. 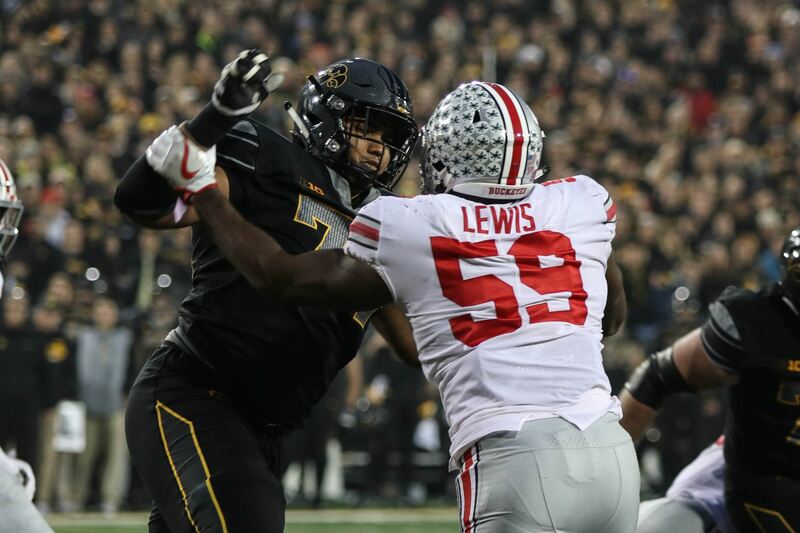 Iowa also ran through Ohio State, averaging 6.4 yards per carry. Hubbard said Wisconsin’s offense has many similarities to Michigan’s, which averaged 2.8 yards per rush in a 31-20 loss to Ohio State on Saturday. Baker believes his team’s upcoming game will be even more difficult. Whether Ohio State will be able to erase that zero in the loss column and hand the Badgers their first loss will likely come down to whether its defensive front can overcome a size disparity up front and contain Taylor.